Ever since I moved into my humble home I’ve toyed with the idea of adding a picket fence for front yard curb appeal. I love the idea of a quaint little fence defining the landscape with an element of charm. Once the fence is up, garden areas can be established in strategic locations to provide greater viewing pleasure. Inside the fenced front yard, I can create new garden spaces and eliminate a good section of the grass. My neighbor across the street had a wrought iron fence in her front yard. She took it down when she moved – I’m not sure why. But the new owner has ripped out all of her perennial gardens. He’s a young single man who probably didn’t want to maintain them, so I can’t say as I blame him. 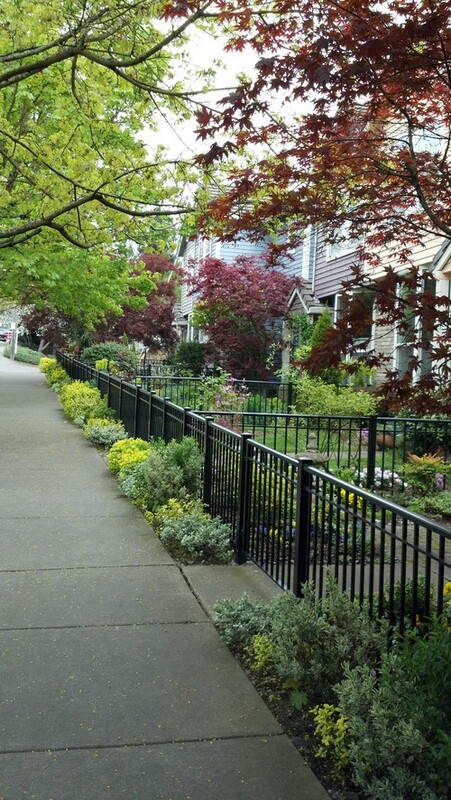 Photo by RailPro of Oregon, Inc.
And so, I keep thinking of adding a picket fence in our front yard to create an enclosed garden space. Passersby can see the tall flowers through the pickets and enjoy the view. And we do get a lot of people walking by even though our town is small, because our street dead ends into the path that cuts through the forest preserve. 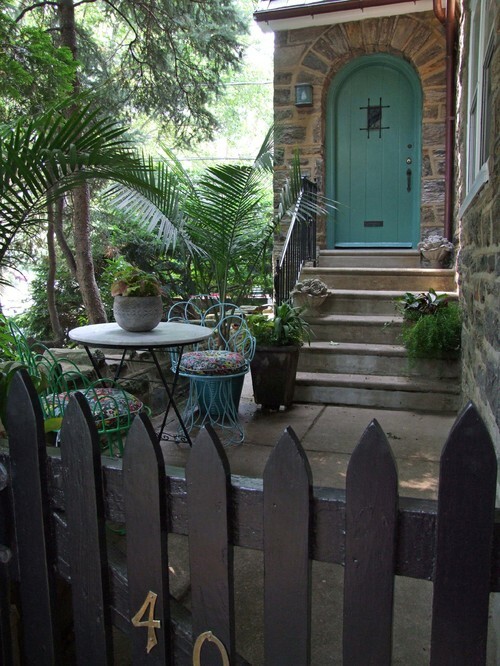 I like the idea of fencing off the front yard and creating a cozy courtyard. 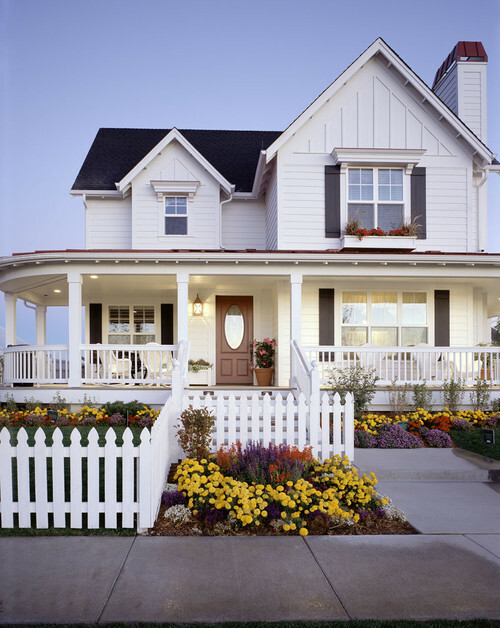 Although a picket fence in the front yard creates a barrier, I think it also adds a welcoming element to a home. Especially if the gate is left open. What do you think? 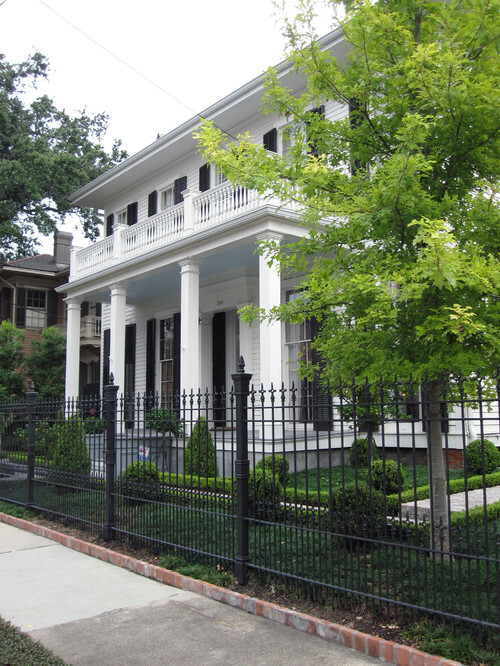 Are you a fan of a fenced front yard? I always like the idea of walking by and peeking over the fence to see what gardens are being protected from passers by. It feels intriguing to me. And now … to announce the winner of the book, Martha’s Flowers! Congratulations to Marlene S. She’s a regular reader of my blog! I have always wanted a house where I could have a picket fence. Unfortunately I haven’t lived in places where it would work. So if you can do it, go for it. I love white picket fences. They are so charming. I would love to put one up but living on two and a half acres would make it to expensive. I just love love love your home Jennifer. What a wonderful idea!!!! That would be gorgeous in your front yard !!! All of those pictures that you shared are picture perfect !!! Such great ideas…………………. There is a geometry to a welcoming front and it is enhanced by a fence. Thank you for the insp[piration. I think it depends on the yard and house layout. A shame about your neighbor’s yard but like you I get with it being a single guy. The neighbor may have taken the fence if the gentleman was going not keep it. Maybe using it in a new yard. Yes !!! 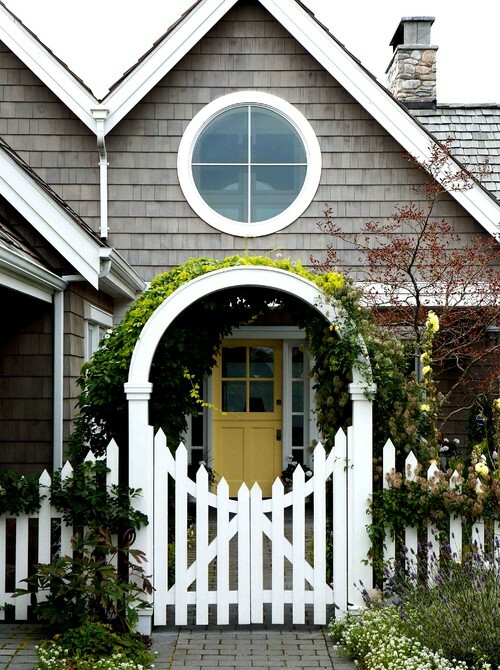 I love picket fences they are so cute and definitely a beautiful feature to a home. 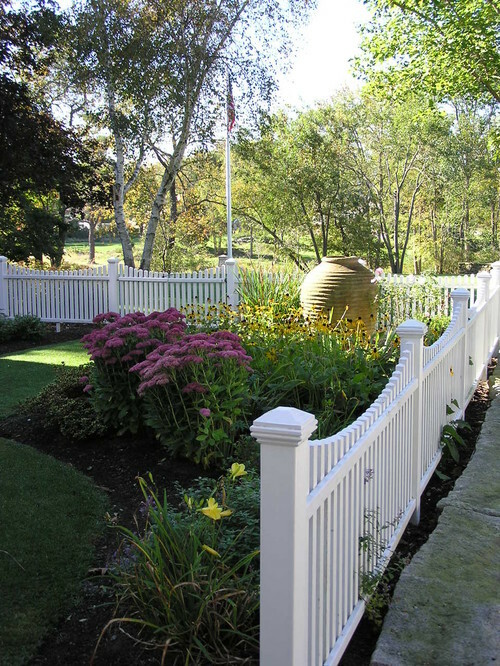 I have always loved the idea of a picket fence, i think it adds to the appeal of a home. When i see a home that has one i want to stop and really look and enjoy. Thanks,Jennifer i will enjoy the book tremendously. Fences seem to say to me that someone cares deeply enough to “protect “ that space.